Mission Geography uses existing NASA data and images where possible to engage students in active, hands-on inquiry, modeling the scientific method and developing students' understanding of environment-society relations and Earth science. 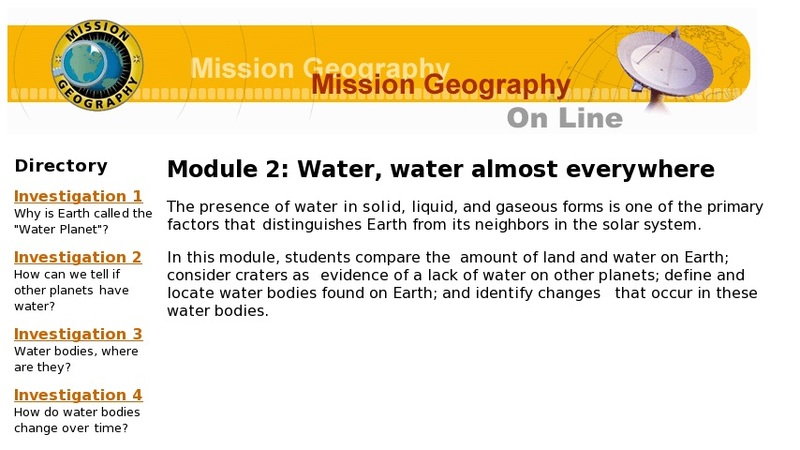 In this module, students compare the amount of land and water on Earth; consider craters as evidence of a lack of water on other planets; define and locate water bodies found on Earth; and identify changes that occur in these water bodies. The module contains four investigations in which students compare the amounts of land and water on Earth, learn that the presence of craters indicate a dry planet, study and compare water bodies, and explore how water bodies respond to changes in weather and climate. Each investigation is complete with overview, a list of materials and supplies, content preview, classroom procedures, worksheets, background, and evaluation.